Over the past couple weeks we have been sharing wine and food socials among friends. We alternate homes and last Saturday Louis and Rich hosted at their house. Each couple agrees to bring a couple bottles of wine, along with appetizers when we get together. This time Chris prepared hot Goat cheese and salsa dip and garlic crustini’s (modeled after Chef Kevin’s at Nectar) along with a cheese and cracker platter. We arrived around 5:30pm just before Dave and Heather. Louis had arranged the table nicely and had many appetizers prepared. There was a bottle of Chianti on the table along with an empty 1999 Clos Pegase Cabernet Sauvignon bottle with the Cabernet in a decanter. The six of us were seated at the table visiting when Rich poured each of us a glass of the decanted wine. We were enjoying various appetizers when I decided to grab my tasting sheet. I was seated next to Dave so we could rate the wines together. The color of the wine was a nice Ruby color and you could see it was showing its age but it still looked beautiful. 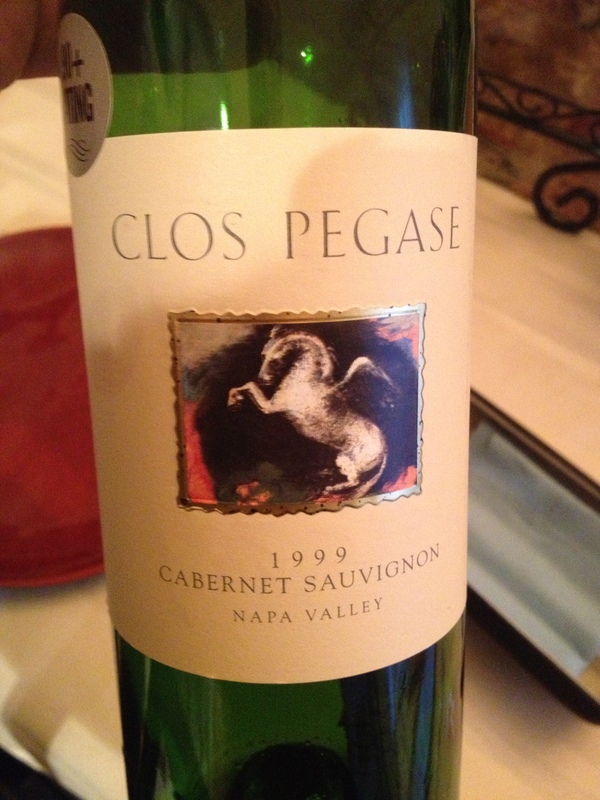 The 1999 Clos Pegase Cabernet Sauvignon was very aromatic. The nose gave it away that it was middle aged. Some of the aromas we could smell were Tobacco and Ripe Fruit and while it was very floral. The Cabernet Sauvignon was not dry. It was still full bodied and the acidity was good. My mouth salivated with every sip. 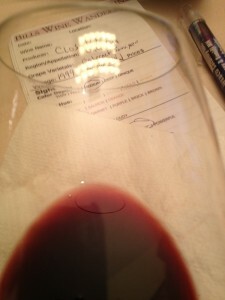 The tannins were medium and soft and the wine was very flavorful with a medium finish! Some of the flavors we noted were Cocoa with a slight Green Pepper finish. 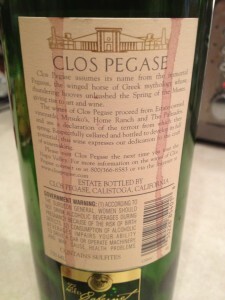 We all enjoyed the 1999 Clos Pegase Cabernet Sauvignon and it went really fast. We rated the Cabernet Sauvignon from Clos Pegase four glasses. 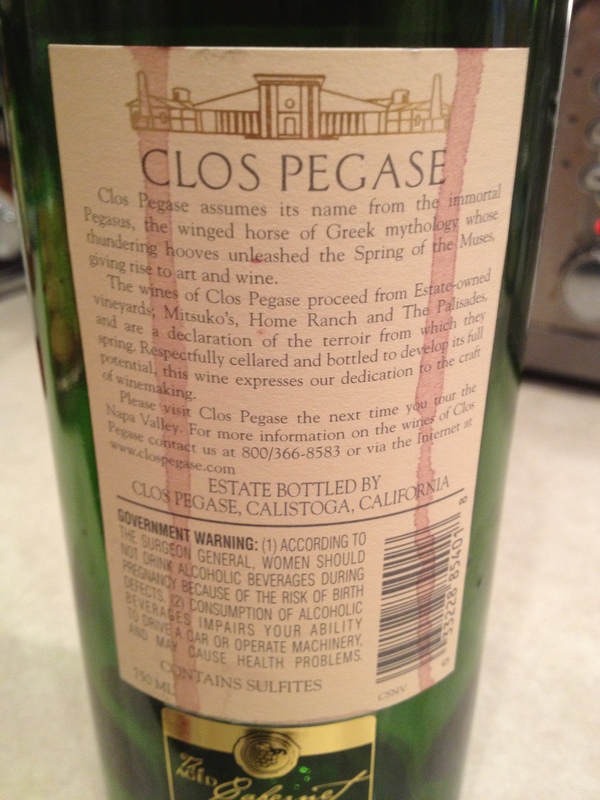 I plan on making a trip to Clos Pegase next time we are in Calistoga.